Growing up, I was taught that stealing was bad… clearly Thievery didn’t get the memo. With an idea that the “menu was stolen from a big shot chef”, I don’t mind though, because the food here is too good not to be shared. 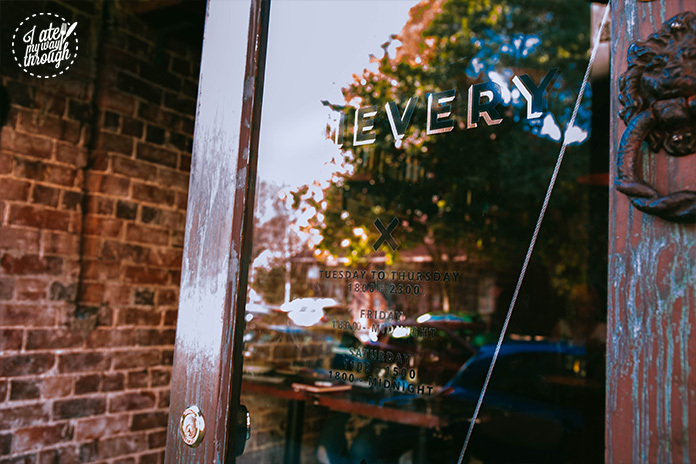 It was actually my first time venturing into Glebe for a meal and we may have walked past it at least 3 times… we looked like a bunch of tourists, but hey getting lost is always part of the adventure with me (never ask me for directions clearly). 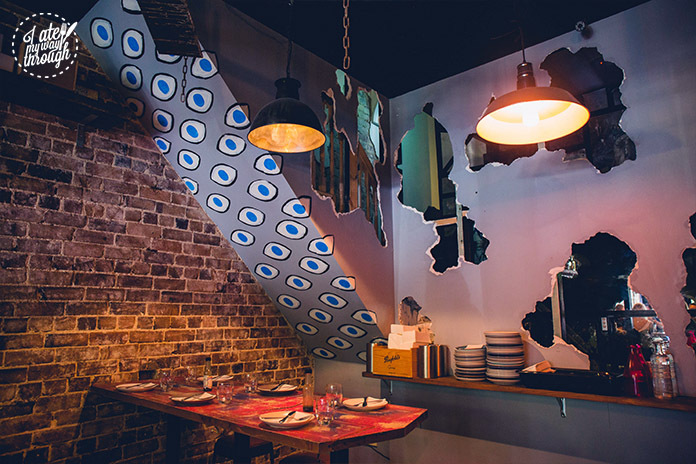 The moment you walk into this hole in the wall eatery, you are immediately transported to another realm with its quirky ethnic interior; from the Arabic graffiti to the literal holes in the walls. 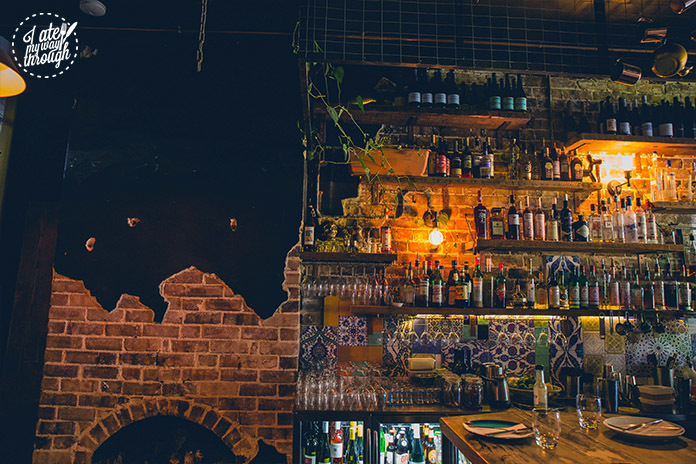 I personally loved the exposed brick walls, which complemented the dark metal tables; I felt as if I walked into a thieves’ hideout. 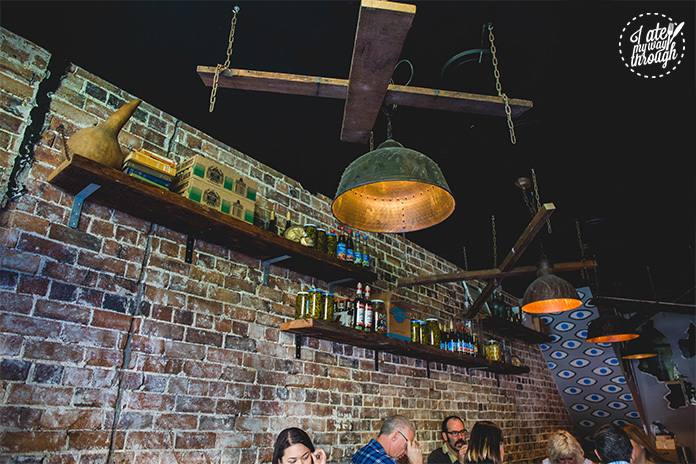 The menu here pays homage to the chef’s Middle Eastern roots and having little to no exposure to the cuisine, this was a great introductory experience that opened my palate to new flavours. We started off the lunch with a couple of cocktails because you know, it’s 6pm somewhere in the world which means it’s never too early to drink. 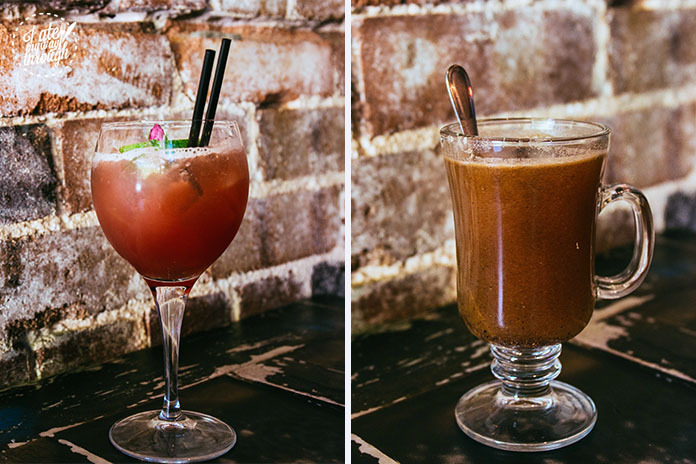 The Wet Rose ($16) comprised of a tea-infused Stoli vodka, pomegranate liqueur, lime, rosewater and cloudy apple. This cocktail had a subtle sweetness, which was quickly cut through with a nice tang as it slid down my throat, whilst ending on the floral notes from the rose water – it was spring in a cup. Alternatively, if you wanted to describe winter as a beverage, the Hot Buttered Soul ($16) would be it, as it consisted of a Sailor Jerry spiced rum, butter and spices and is served hot. Since being heated, the star anise was more emphasized and felt like a warm hug on the inside. The rum was quite strong for my liking however the butter added that soothing richness to the end. 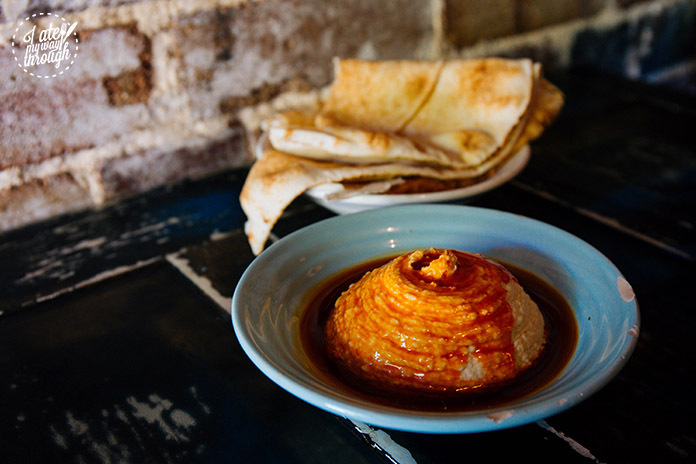 Next up, we were feeling a little daring and ordered the Thievery Nayyeh ($16). 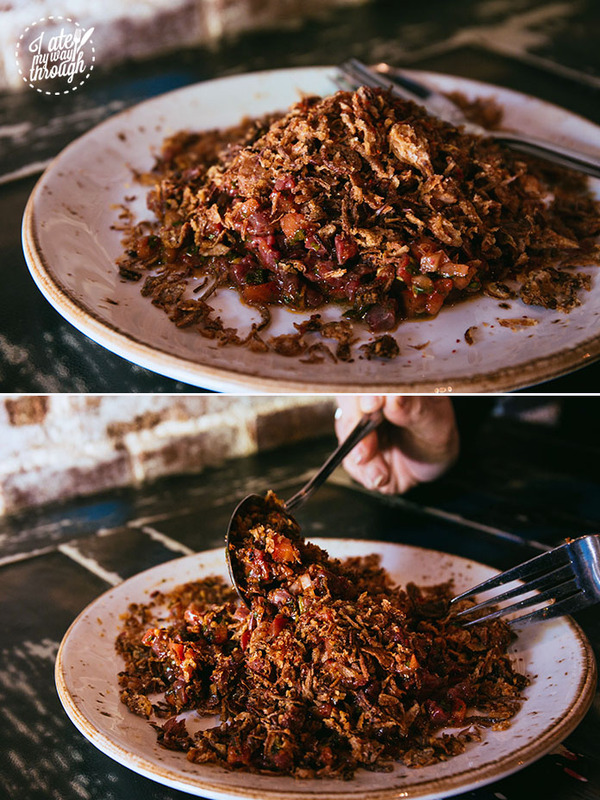 Think of it as a Middle Eastern take on a Beef Tartare. Eating raw meat is a bit gamey for most people, but I personally love Korean Yukhoe, which is the Korean take on beef tartare. The tartare here was bursting with flavour and consisted of textual bites. From the soft yet chewy cubed beef pieces, to the crispy onion pieces, it worked so well with the sharp zing and subtle spiciness of the marinade. The Roasted Cauliflower Fatoush ($16) was also a new dish I’d never tasted. The salad itself had plenty of mint, radish and tomatoes which all added a refreshing element to each bite. 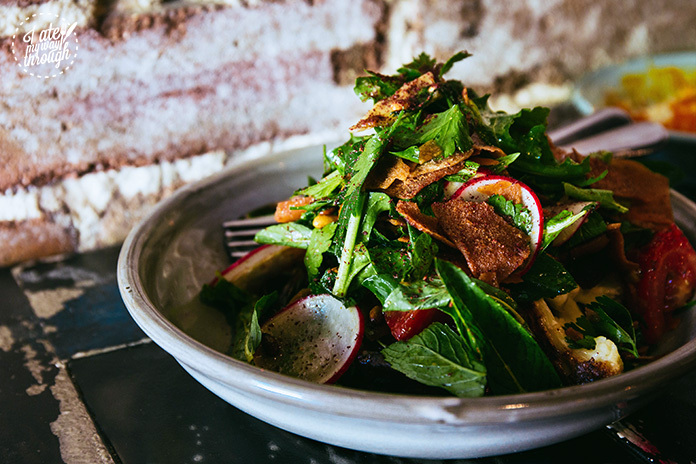 The pine nuts, roasted cauliflower and fried Lebanese bread shards scattered throughout the dish were the textual elements and certainly brought the crunch the dish needed. The layers of saltiness, tangyness and citrus notes all elevated the deep roasted flavour of the cauliflower. Moving onto something I’m sure we have all had (and love) — the kebab! 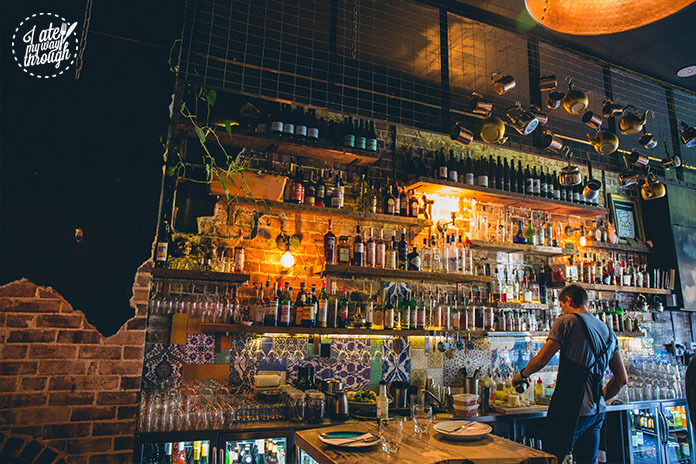 Thievery takes the more upscale approach to the classic and strays away from that late night 3am hangover ones we may all fondly remember (just me… ok). 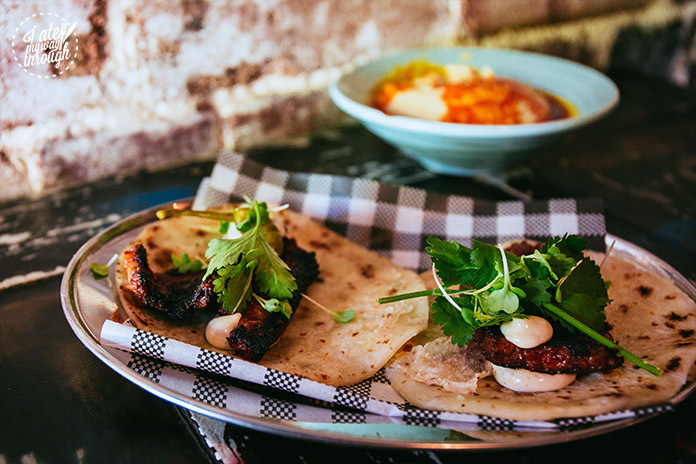 The Angus Beef Kebab ($14) has harissa, smoked garlic and pickled peppers in house made Lebanese bread, which really reminded me, more of a Mexican tortilla. The amount of flavour that this kebab brought was amazing – with a rather robust zesty flavour with an added creaminess from the sauce it worked well with the spicy beef that had an intense roasted flavour especially on the charred edges. The pickles were great at cutting through the richness with its tanginess and sourness. The BBQ Octopus ($19) was another favourite. I loved the contrast of the dish; the simplicity of the BBQ Octopus allowed us to truly appreciate the natural sweetness of Octopus and the complexity of the roasted eggplant underneath highlighted that. The roasted eggplant had a mixture of whole roasted garlic and roasted tomatoes folded throughout. Now with a trio like that, you just know that the flavours were intense. Each element melded together and played a certain note to the melody. 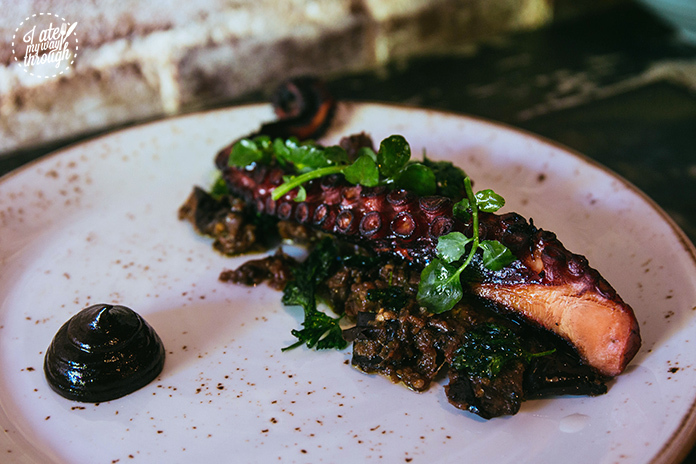 From the saltiness, the sharpness and the sweetness, it elevated the BBQ Octopus and when smeared with a bit of the fermented black garlic sauce, it just wrapped this dish together in harmony. 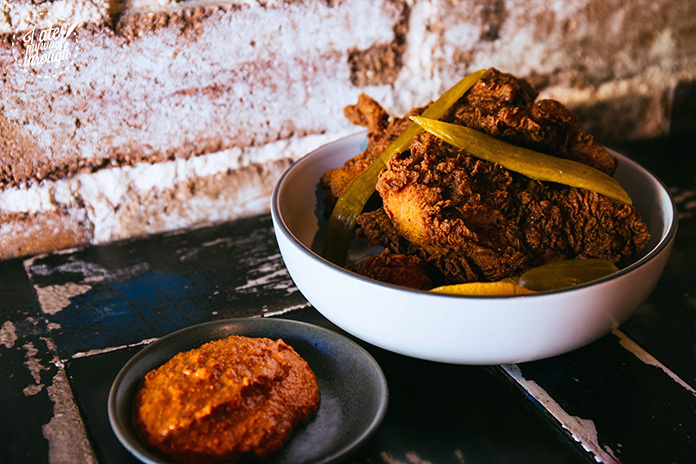 We’re moving into some serious territory now as we delve into the idea of Fried Chicken. Thievery offers LFC ($14) or Lebanese Fried Chicken which to be honest is pretty much the same as Butter’s Fried Chicken, and we all know how much I raved about that! The only difference I can see is that the chicken here had a slightly lighter coating which allowed me to taste the juicy chicken more as well as the hot spices involved in the flour batter. The pickles were great at cutting through the greasiness and palate cleanser in between bites while the sauce on the side added another dimension and another layer of heat to the chicken that the Butter counterpart just does not have. Onto dessert, if you wanted a truly sweet treat to satisfy your sweet tooth the desserts here won’t be the answer. Staying true to the roots, Middle Eastern desserts aren’t at all that sweet which is something I’m pretty use to. 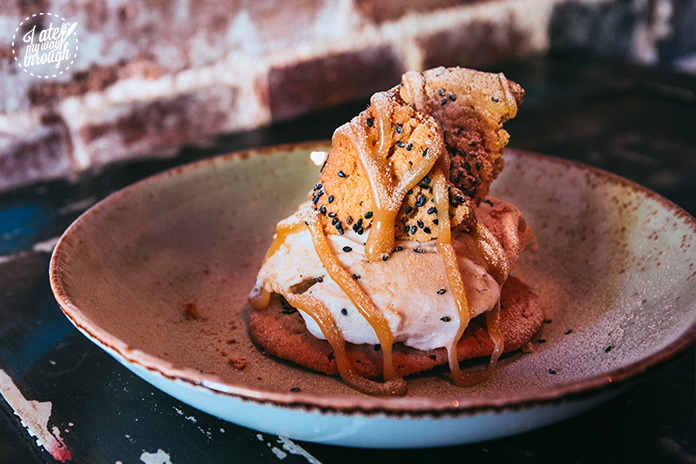 The Tahini Cookie ($14) has a drizzle of tahini honey, candied ginger and vanilla ice cream. This was interesting and quite pleasant on the palate. The cookie itself was chewy and the black sesame added certain nuttiness to each bite, while the tahini honey had an uplifted sweet flavour that also complemented the coconut milk based vanilla ice cream with it’s light, aromatic and floral flavour. I may not have enjoyed the candied ginger however with the few bites I did have with it, it cut through the sweet honey nicely. The last dessert we tried, The Persimmon tart ($14) may not have been my favourite dessert but I appreciate the originality of the dish. Consisting of poached persimmon sandwiched between two sheets of puff pastry with a side of rice cream – at first glance the only word I was saying in my head is what Meghan Trainor has said repeatedly…”NO”. We were advised to eat it all together which was the right way to enjoy it. When each element is eaten on its own it is extremely overpowering, but when a little bit is eaten in one bite, the airy rice cream had a subtle sweetness, which juxtaposed the bitterness of the poached persimmon. 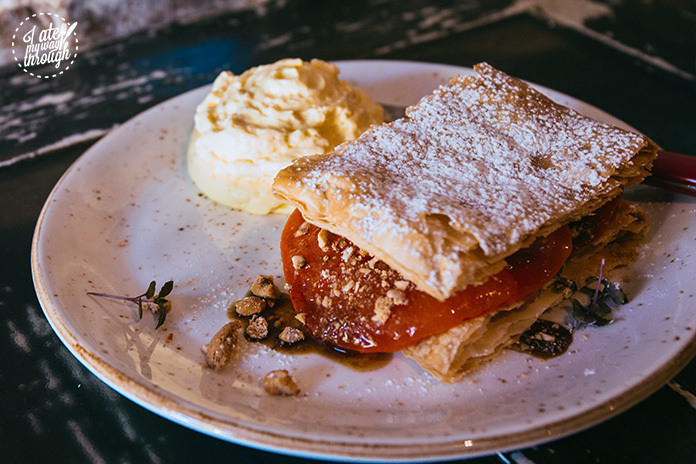 The pastry had a great shatter and buttery flakiness so it added a layer of richness that this dish was screaming for.